A Frenchman Reveals my Feeble Brain! Recently I've gone Dutch, tried a Finn or two, been to Siam, sampled some Czech and Afrikaner and definitely gone to the US and Austria! Now I'd really like to show off something French! Last week I showed you something cheap and available to everyone and now as a complete contrast I'm exhibiting something very rare indeed. It was bought quite near the beginning of my addiction in October 2011 and for me, at that time, it was a very significant purchase having cost me €100! Lord how my madness has worsened since then! I now consider that price quite reasonable! 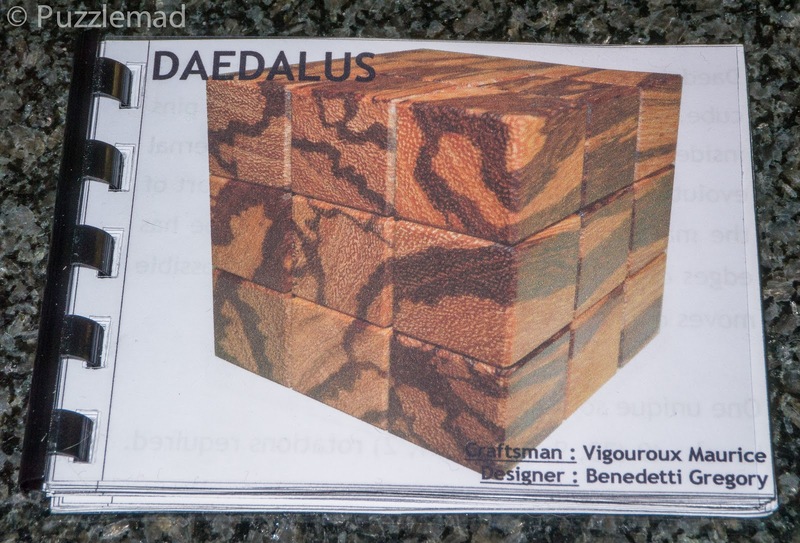 Pictured at the top and the subject of today's blog post is the Daedalus puzzle - it is another unique design by the amazing Gregory Benedetti (from France) and made by the hugely talented Maurice Vigouroux (also French). 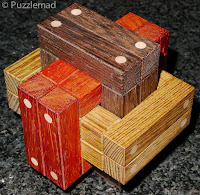 This was one of three puzzles that Gregory had entered in the 2011 IPP design competition held in Berlin. That year his Ambigram Burr was one of the top ten vote "getters" and was so good that I had to obtain a copy for myself - one day I will review that too. The first few were made in Marblewood and sold very quickly. Maurice made a couple more batches in assorted hardwoods and they all sold very quickly on Puzzle Paradise. I was lucky enough to be in touch with Gregory and got mine from him personally - I was less discerning in my knowledge of woods at that time and I think the only wood that I recognised was Walnut so that was what I chose. I've not seen one at auction in years and so have no idea what it might cost today. The cube arrived with a rather beautifully made spiral bound booklet with 52 pages of wire frame pictures showing the step by step solution process - I was very careful to admire the booklet quickly and then file it away without really paying any attention to the steps it showed. I wanted to solve it myself! I wanted to become a puzzle maestro like Allard and then be able to boast on my blog that I was able to solve a puzzle so difficult that Burrtools could not solve it. Silly me! 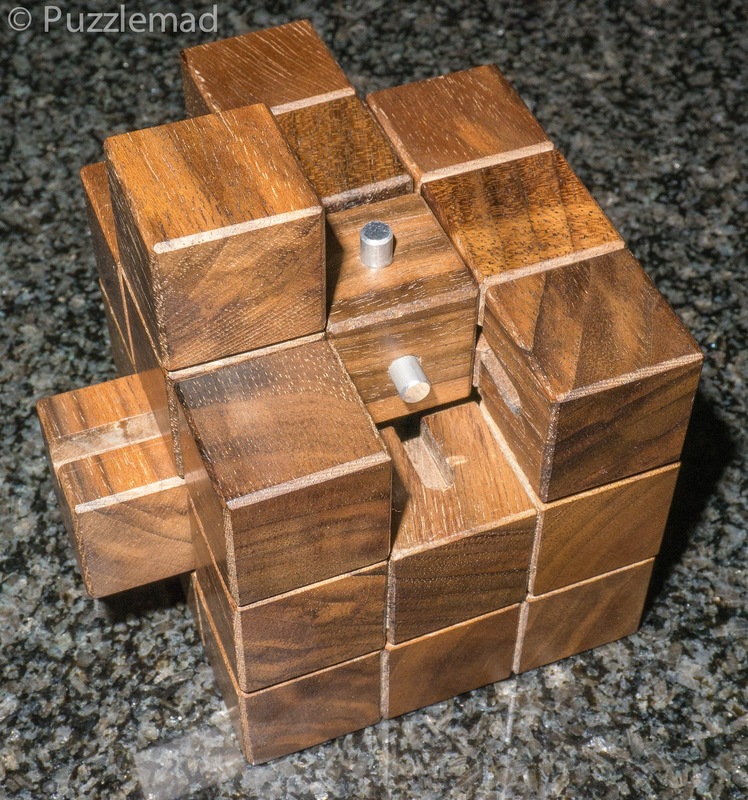 I have many times on this blog mentioned that I am "a bear of very little brain" and this puzzle has proved it - my insistence in not looking at the booklet meant that it has taken nearly 4 years to solve the blasted thing! Maybe I shouldn't have been surprised - Brian discussed it here and found it VERY difficult. Neil managed it without too much difficulty and wrote a stunning review here. 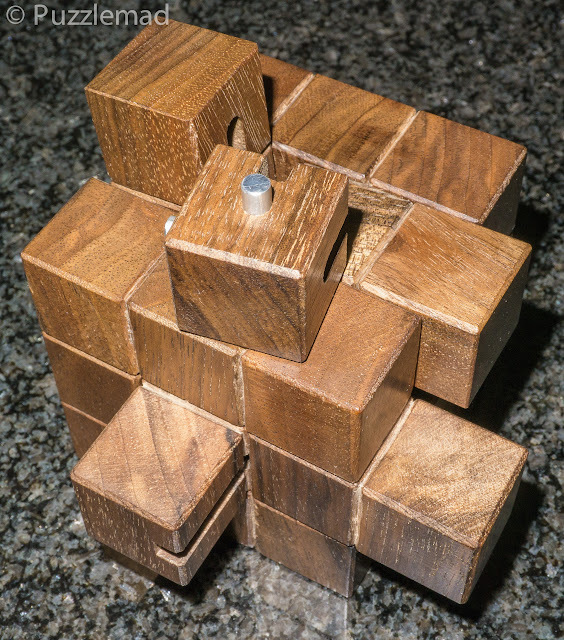 When I first got it I fiddled for a few weeks and got stuck - it was very early in my puzzling career and I had really not gotten much practice at interlocking solids and almost none with rotational puzzles. I was completely overwhelmed by all the directions and options. 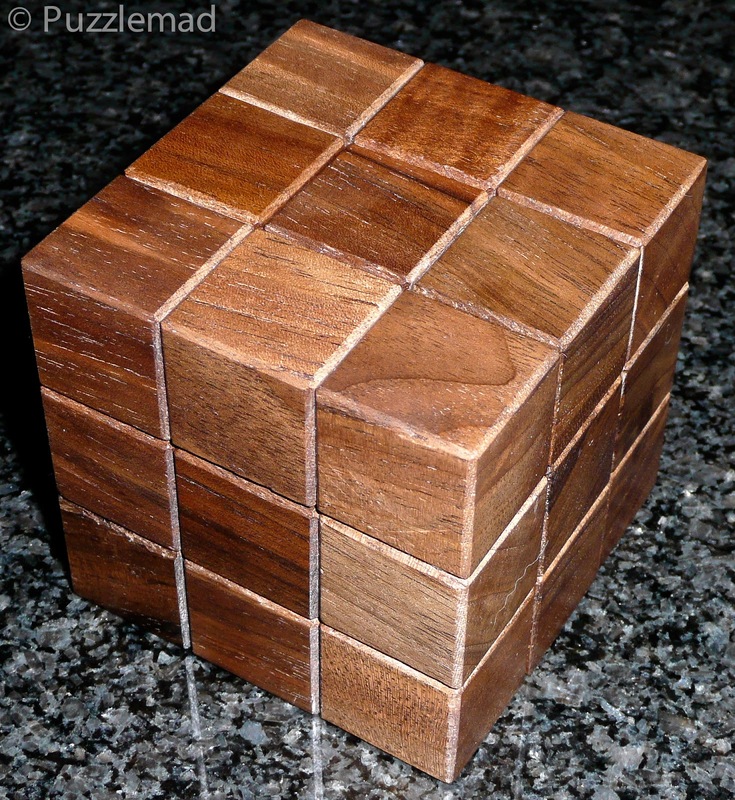 After a month or so this went on my shelf above my computer (where my most prized puzzles go) and I gazed at it periodically with longing and even tried to solve it intermittently but, to be honest, it frightened me to death! I know! I'm a puzzle wimp! Sitting above my desk on the right hand side 1 shelf up from the bottom! Daedalus on Fermium and next to Cannich - all 3 unsolved! So after about 6 months of trying on and off, it sat on that shelf taunting me. Like many things French, it is very good at throwing epithets at the English (it's a history going back 1000+ years) and it, along with it's brothers, looked down at me and threw vile comments on my puzzle manhood but whenever I picked it back up, I got very confused very quickly and put it back. At least I was able to return it to cube shape - I was informed earlier this week by my genius friend Derek, that he had also not solved it and his copy was stored in a scrambled state somewhere in his house! This did make me feel just a little bit better but not much. Eventually I actually gave up trying and just admired it tremulously whenever I looked at my shelves. 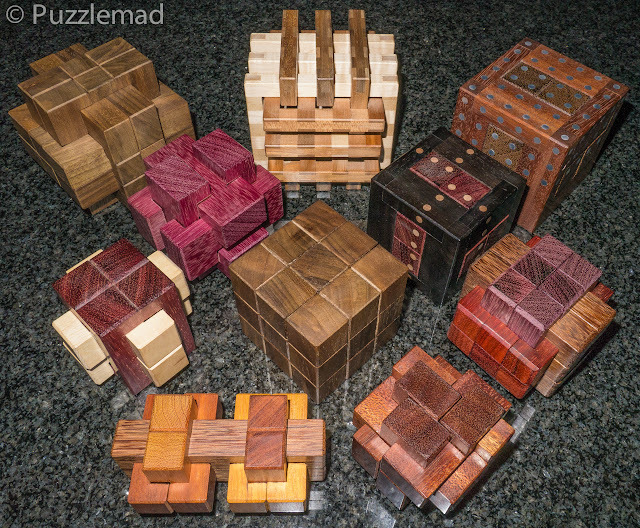 Gradually over the months and years I have accumulated a quite a few more puzzles made by Maurice and I'm proud to say that 1 or 2 have actually been solved. I was very recently reminded about the unsolved Daedalus when a post on Facebook by a new friend Kevin Maynard, showed that amongst the burrs that he had bought was the Cannich burr designed and made by Alfons Eyckmans. I had also bought a copy of Cannich made by Maurice from the French puzzle web store Arteludes and it was another of my gorgeous puzzles that had proven too difficult for me to solve when I bought it. My original aim after being reminded about Cannich was to try and solve that interesting 18 piece burr but in my usual fashion I got distracted and picked up the adjacent Daedalus too. This time I decided that I HAD to solve it. After just a few moves it sprouts arms and legs and teeth as you manipulate it! 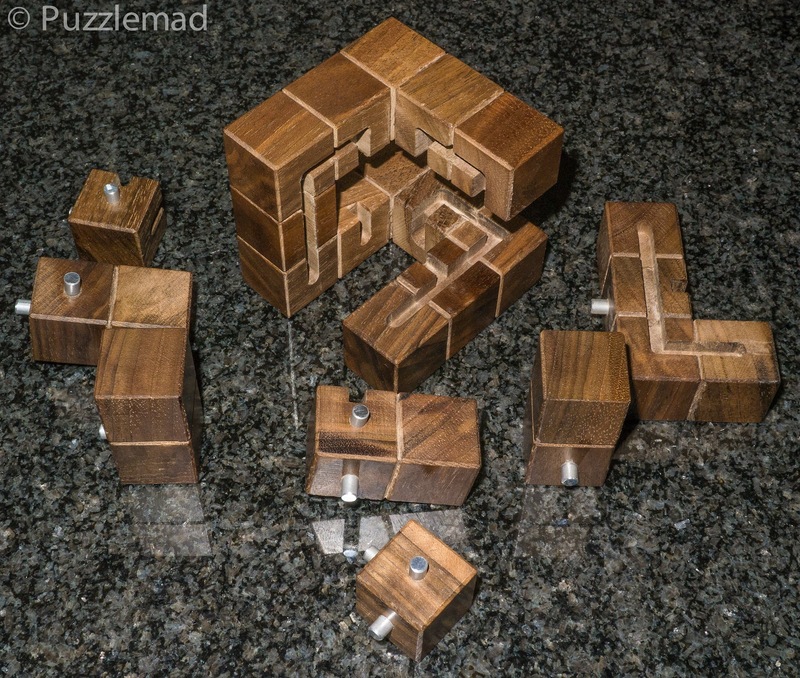 This puzzle is the most incredible and unusual design I've ever seen. It's an interlocking solid that requires rotations (i.e. a TIC) but not like any of the traditional ones I have played with before. This one has a series of pins and tracks on the inside making it more like a maze puzzle. There's a huge BUT however! As pieces slide through the maze linearly and as they rotate this then alters the pathway itself - yes the maze is dynamic. On top of this you can only see a few small segments at any one moment. You'd have thought that having solved the entirely hidden and dynamic mazes of the Bronze, Silver and Orange Revomazes, then I should find this an easy puzzle but alas no, I really struggled. I solved the Revomazes with mapping techniques using pen and paper but I could not seem to work out a way of mapping the Daedalus. The solution to my dilemma? What I usually do with burrs is just fiddle with them until I find something that seems to get somewhere and then move back and forth to set up a muscle memory of the pathway. This time I tried the same approach here but I really struggled with the rotational aspects! The problem (in my small brain) seems to be that quite a few of the pieces are able to rotate and some could go through a full 360º which ruins my muscle memory - it also means there are many, many potential blind ends. With a level of 22.8.7.2.2, with all those blind ends, this is one hell of a tough challenge! But this time I was determined and I kept going. After about 3 evenings of trying, I suddenly saw a new move. I am sure that I'd been at that point many times before but this time the puzzle screamed at me "try this you dummy! Maybe you can make an exit here". So I tried that single new rotational move and it opened up a whole new pathway for me. It did get blocked at one point but a little thought and I was able to deliberately design a sequence to move the blockage. Suddenly I was off! A piece came out! Yay! At last! At last! Only 4 years to get the first piece out! Like many burrs, the removal of the first piece does not seem to make the puzzle any easier - in my experience it just seems to open up more choices and hence more blind ends. Even after my initial breakthrough I really hadn't mastered a way to think about this puzzle - the way the pathways change really played with my feeble brain. The next discovery came by luck - the way I was holding it made a large section of the base of the puzzle slide but not far enough to achieve anything useful. What it did do was get me thinking whether there was a way I could move the other pieces to allow that slide to go further. Suddenly it clicked and I found myself deliberately making moves to create a pathway for the other pieces. Once this had happened, I discovered a beautifully sweet move to remove the second piece and after that I was able to take the whole thing apart. Oh the relief was wonderful! Lord! I hope I can put it back together again! Allard said that he had to use the instructions to reassemble his copy but for me having spent 4 years on the puzzle, I actually had enough memory and understanding that I was able to reassemble even after scrambling the pieces. If I do get a bit confused occasionally then I find I can work out what pieces to place by thinking about the moves they have to make. This is a truly awesome and very unique design! 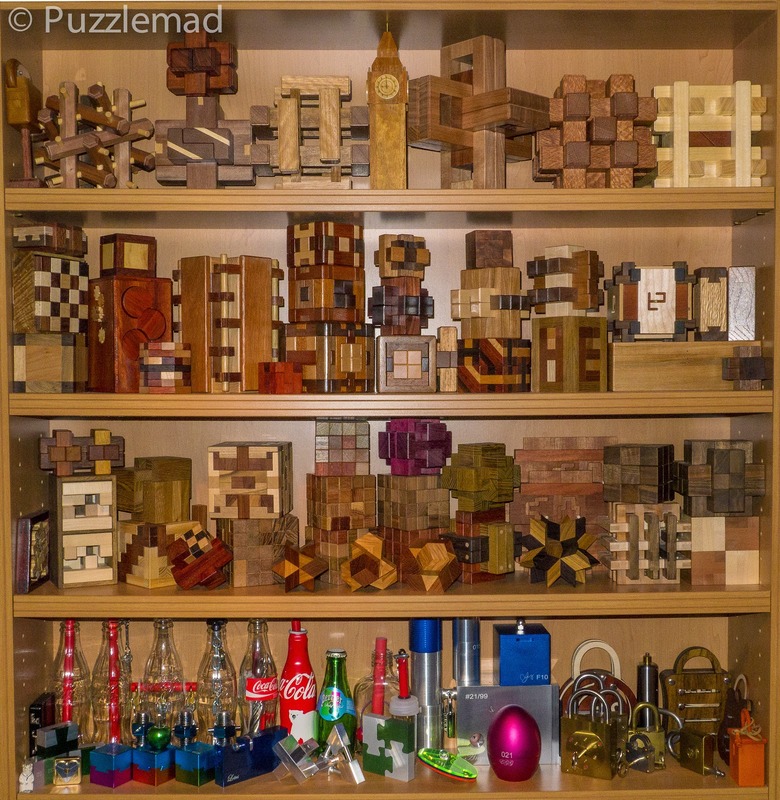 It is certainly a very tough puzzle to solve (at least for me) and luckily also looks great on the shelf because mine spent a very long time there before I finally managed it. If you do ever see one at auction then don't hesitate - it is a TIC and a burr and a maze - it's like nothing you will ever see again. I didn't like the look of Daedalus, and when I saw the gigantic solution book, I knew it wasn't for me. Instead I bought an Ambigram Burr, and I have been quite happy with it! I'm less discerning than you - I had to have both!!! Amazing! What a fascinating mechanism. Congratulations on finally solving it! It's a wonderfull puzzle. Gregory had created a very clever one. Long time since we've spoken! I hope you are well? Most of the puzzles I have from Maurice came through your fantastic store! Hopefully something new soon? I agree that the second piece removal is just as tough as the first cube! Having finally finished it, I can appreciate Gregory's genius. I really enjoyed this post Kevin, thank you. The Daedalus looks like an amazing puzzle and a great feat of ingenuity and design and with four years worth of puzzling it's an absolute bargain! Thank you Paul, I always appreciate feedback. It is a stunning puzzle and you're right a bargain! I just need to convince Mrs S that they're all worthwhile!